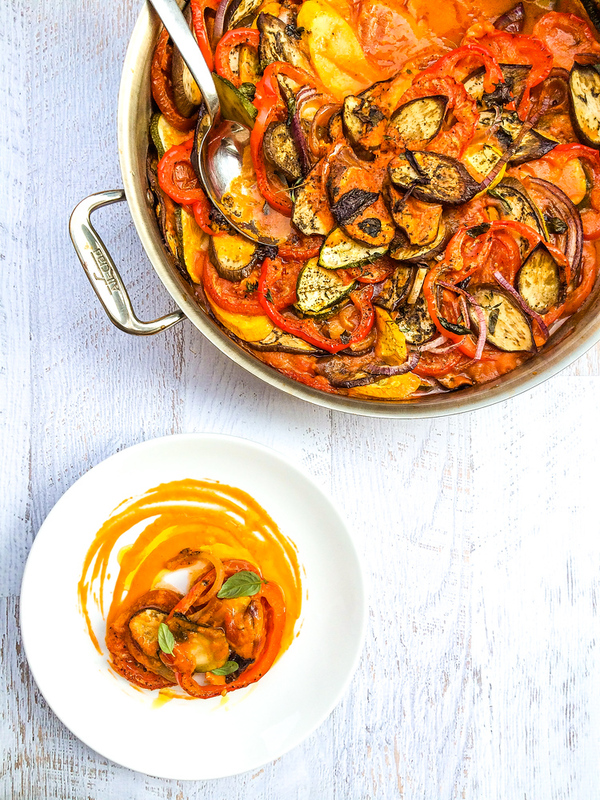 A classic French ratatouille recipe that is vegan, gluten-free but has lots of flavour. 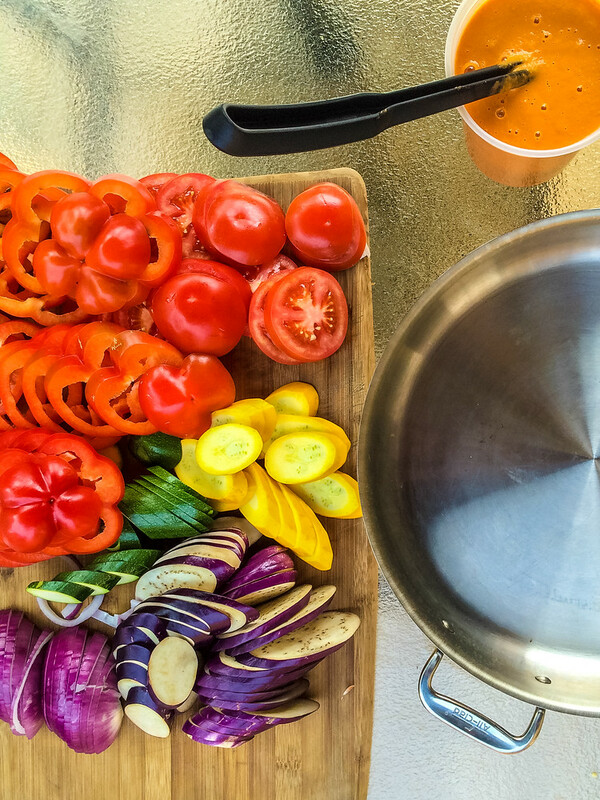 This ratatouille recipe is part three of our five-part weekly series on classic French cooking in partnership with All-Clad Canada – without this 4 quart braiser pan this would not be possible. Don’t miss our Red Wine Braised Short Ribs recipe and how to cook duck breasts like a French chef. Classic French recipes seem intimidating because they require specific techniques but that’s what makes a cook. Perhaps you don’t try this mid-week because it requires a whole lot of chopping but ratatouille is a great Sunday afternoon recipe listening to great music and maybe even having a glass of wine…or two. While it’s considered a summer dish found throughout the Mediterranean coast it’s also great in colder weather because it’s warm and comforting without the heaviness of braised meats or stews. Plus it’s a one-pot recipe so if you’re a lazy dishwasher like I am it makes Sunday evenings so much better! This Ratatouille Recipe is a Bit Different. Many great French cooks will say that you need to sautee each vegetable separately to enhance flavours. They argue they won’t fit in a pot raw and therefore steam instead of brown. Screw that. Ratatouille is a country dish and cooking each vegetable separately would take far too long. It’s why we love our braising pot, with 4 quarts you can layer the vegetables and they cook beautifully. Where Does Ratatouille Come From? 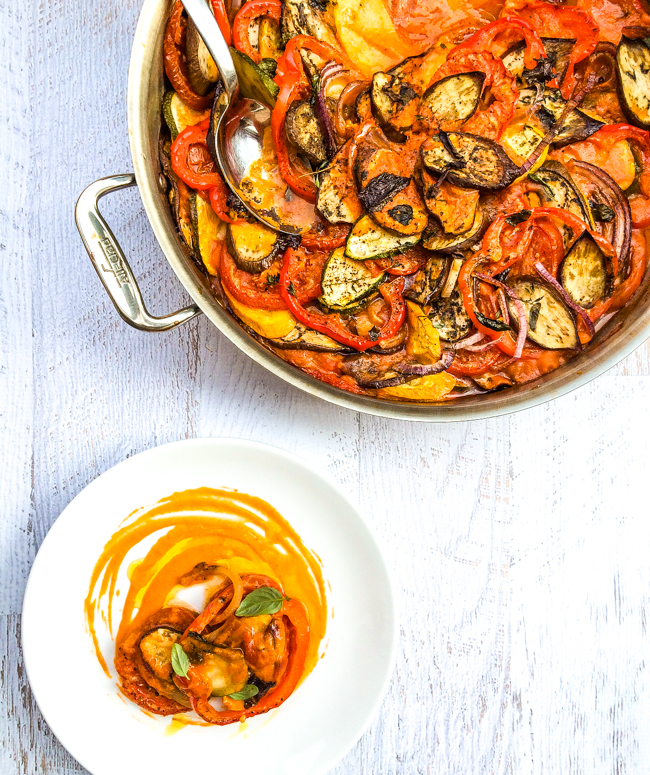 Ratatouille is a traditional Provencal stewed vegetable dish from Nice. Like most of the world’s best dishes it is a rustic peasant dish. While the authentic recipes tout specific vegetables this is really a dish for whatever vegetables are in season. Although the Disney movie made the dish once again popular it’s technically not authentic, the recipe used is Confit Byaldi, which you can find in The French Laundry Cookbook. But vegetable stews have been around for ages. 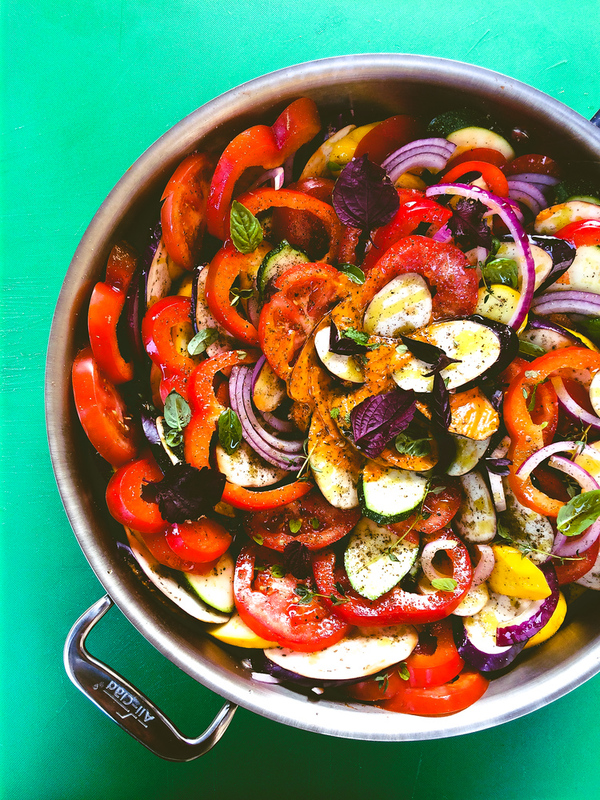 Before ratatouille existed there was Bohémienne de légumes which only uses eggplants and tomatoes. 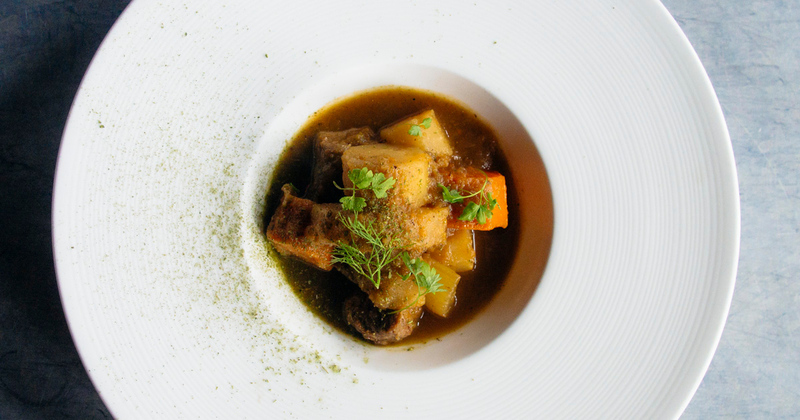 Not surprisingly around the world you’ll find many similar dishes to ratatouille. No only the Catalan samfaina but also the Majorcan tombet, Greek tourlou and Turkish briam. Spread 3/4 of tomato sauce into a pan that will fit all of your vegetables. Begin to layer vegetables (i.e. tomato, then zucchini, then pepper) in a clockwise rotation beginning in the centre and moving outward. Don't worry about the order of the vegetables as you'll have more slices of some things than others. Fill in any gaps between the vegetables with remaining tomato sauce. Season with salt, pepper, and dry oregano. Drizzle with olive oil. Bake uncovered for one hour. 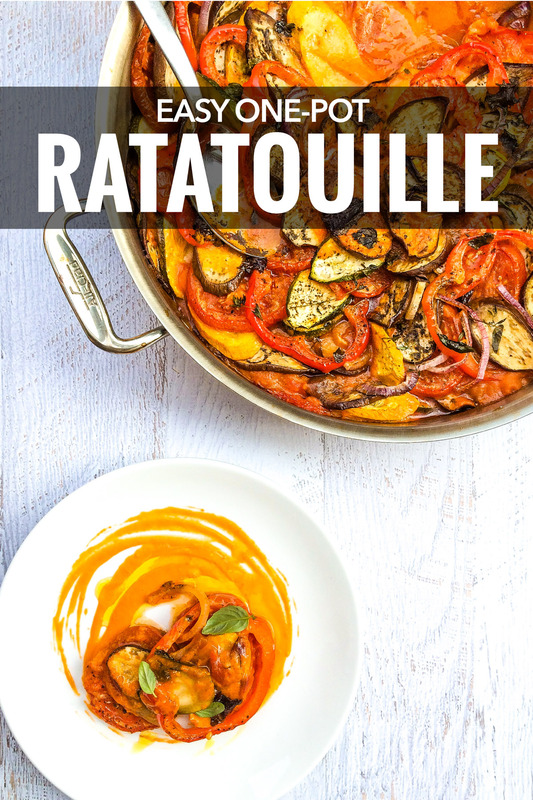 You can eat ratatouille on its own as a side dish but it’s so versatile in other dishes. You can add it to pasta, or top it with an egg. It’s also amazing on great French bread. 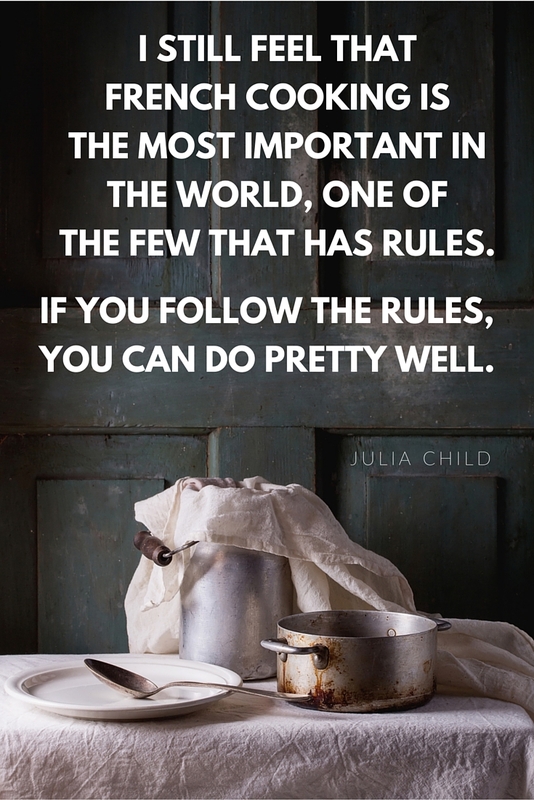 Are there any other classic French recipes you love? Share them in the comments below. Just in time for healthy New Year’s eating. Thanks for jazzing up my veggies. This looks fantastic and so healthy. Definitely a recipe I will be trying! Oh my word. What a delicious looking dish, I can’t wait to try it! Also, I love the backgrounds for each of the photos. Mouth watering yummy !! What a delicious looking dish. Thanks for the recipe. Must try. I am really looking forward to trying this recipe and LOVE the photo presentation.I am a little worried that I missed something that may be obvious to everyone else. What am I supposed to do with the basil leaves? Are they just a garnishment (like the photo) or should they be layered with the veggies? Thanks so much for asking! We need to amend the recipe, yes use the basil on top. My only comment would be. This is missing mushrooms. They really add something. Provence is much wider than nice. And as well as using it as a side dish you can use it as a stuffing for fish meat or other veggies. Also, although it is not a very garlicy dish a little will add a delightful je ne sais quoi. There should also be onions. And you can use red, green, yellow and orange peppers for colour and variety. And maybe little round courgettes and heritage tomatoes in different colours as well. This is a recipe that I am looking forward to assembling. It has that traditional peasant appeal and is uncomplicated. It appears that the tomato sauce is the basis and I reckon that a good homemade one is essential. I’m glad that how to use the basil was cleared up. It’s a garnish on the cooked dish ? Also use of additional ingredients like , mushrooms, garlic etc., and that it can be used as a delicious pasta sauce ; great !